Should have more information soon. Directly opposite Sky. Demolition of existing structures and construction of a multi-storey mixed-use development comprising tourist accommodation, commercial office, cafe/restaurant, ancillary car parking, and associated building work. Was originally student accommodation at 15 levels. TANGCHEN developer. There's thread in tab 4. That was the smaller site next door. This site has been with Ginos for a very long time. Not overly tall after all that. Hopefully that means Sky Adelaide will still go ahead. This development along with Sky would form a decent little cluster alongside the SAPOL building and the Calvary Hospital. If only that carpark on the corner across the road got developed too. Thank God, 40m or less, I lived on Gilles Street for some time and had to walk past this every day. Hate this building and will happily see it replaced. 43.5m tall and a fair bit less controversial than the Pirie Street proposal. Are the plans online yet? I couldn't see them on the SCAP site. Personally, I think this looks pretty awful, maybe due to the essentially blank North/South walls. This is pretty lacklustre, looks more like a commercial building in an industrial district than mixed use/hotel. But it's not the most proficient rendering, so hopefully it's not quite as boring as it looks. Also attracted one of the more lengthy comments I've read from the gov architect, to which the project architects responded with a pissy "we take issue with the suggestion that 'the proposal does not achieve a high quality design outcome'". Try again, my dudes. That said, it is true that the area will likely see future development after which the poor aesthetics of this proposal will recede into the background. But it would be a good outcome if SCAP withheld approval to encourage design revision in line with some of the gov architects suggestions. Although I note the proponents are keen to start building post-haste. 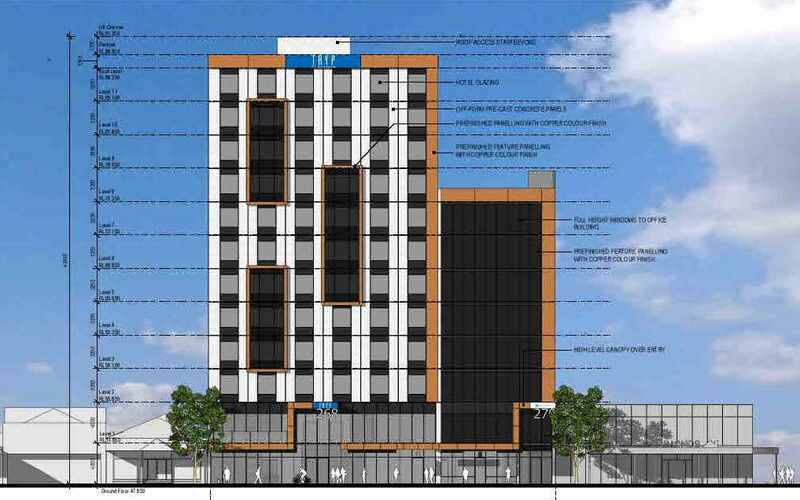 This might very well be the first time I have ever said this, but despite this being bland and relatively crap design, I'll just be glad to see the building currently on this site go. When I lived in Gilles Street a couple of years ago, I would always walk past it every day and wish it weren't there. It's one of those clunky 1950s buildings that doesn't have any character and there's honestly no way to remediate it, and it's apparently a dud of a thing to lease out as well. With a couple of niche, upmarket restaurants/eateries recently opening along this block of Pulteney Street, with the new hospital opening, I can see this becoming a nice blend of old shopfronts and new being filled out with bars and such and giving new life to this section of Pulteney Street. This is such a non-descript filler development.